Caratlane.com Review Part 2: Resolution and Answers from Caratlane. This is in continuation of my Caratlane.com shopping experience (read HERE) that I had shared in Feb end, and I was supposed to share a part 2. So I received my customized earrings (both pairs) with a lock system in the loop around 11 Feb. 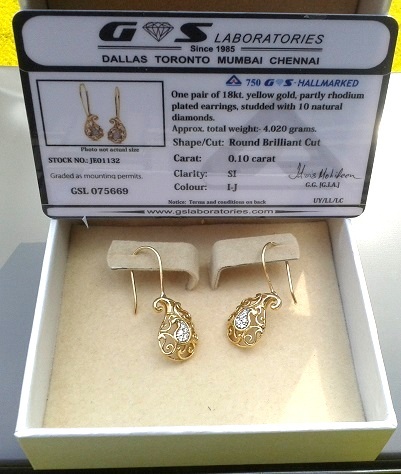 They looked more golden than before and I started wearing them regularly until one day I realized that the weight for the Ethea Paisley Earrings had gone down. I contacted Caratlane and was told that the weight has rather gone UP after the customization. When I mentioned that the certificate is showing a reduced weight, the lady insisted that sometimes there could be a difference in their assessment and that of the jewelry certifying authority. At this point, I took both the pairs to a local jewelry shop and got them weighed. Both the weights were BANG ON as mentioned on the certificate, which ruled out the lady's explanation. So finally I went ahead and shared my experience in that review. A couple weeks later Caratlane happened to read my review and contacted me saying that the weight decrease was unintentional and that a refund cheque is always sent out along with the jewelry whenever such a case happens. They said it got missed out in my case because it was a rare case of repair/customization and that they will be happy to write me a refund cheque. I was also told that they would get back to me after a thorough investigation. I am happy to inform that Caratlane.com has actively resolved all my concerns that I had shared in my previous post. They have made me a new pair of customized earrings with the corrected weight which was hand delivered to me a few days ago and I am finally happy with my positive experience. I have bugged them with questions all these months and they have always gotten back to me with a reasonable answer. They have also taken all the feedback very seriously. They had mentioned making certain changes in their website/system to avoid such incidents in the future and I see that those promised changes have already been implemented, which shows they are genuine. In this post, I am going to share the answers provided by Caratlane.com to the concerns I had raised. To continue from my previous post, remember I had mentioned a guy named Ashish Kapoor, who was at that time the VP Sales at Caratlane? While he was my main point of contact till customization and I trusted the details he had shared, it turned out I was given wrong and incomplete information by this guy. No matter how high your position is, you should never bullsh*t the customer. When my earrings had gone for customization in Feb, and I was not getting a proper response from the Caratlane design team and customer care, I called up Ashish Kapoor to request that I wanted the jewelry back by my birthday on 15th Feb. During the conversation, I got to know that he had already resigned from Caratlane, which means, when he had first called me for feedback, he was already serving a notice period there. And before leaving, he made plans to even out his grudges with Caratlane choosing me as a medium. In fact, I was surprised when he kept following me asking me to publish a review on Caratlane, even after he had left the job. His misleading/incorrect replies to my questions could be deliberate or may simply mean he was not fit for his job and didn't know a thing about the Jewelry he was selling. By the way he spent a VERY short period at Caratlane, so I guess he actually didn't make efforts to learn about his business. 1. Concern #1: My foremost and major dissatisfaction factor was that the weight of my earrings had gone down after customization. Reply from Caratlane: Caratlane sent me some details in email saying that was the weight captured by their system at the time of placing the original order and that the weight has NOT gone down from that recorded weight. They said the weight for the Paisley earrings was now showing higher on their site because they have made changes to the design and the thickness. Since I had no proof of what the weight was shown at the time of placing the order, I was not very satisfied with the explanation and they happily offered to make me a new pair with the weight showing on the site at that time in Feb. I have shared feedback that when a customer places an order, the weight shown on the website should be captured and mentioned in the order confirmation email, so the customer has an official record of that. 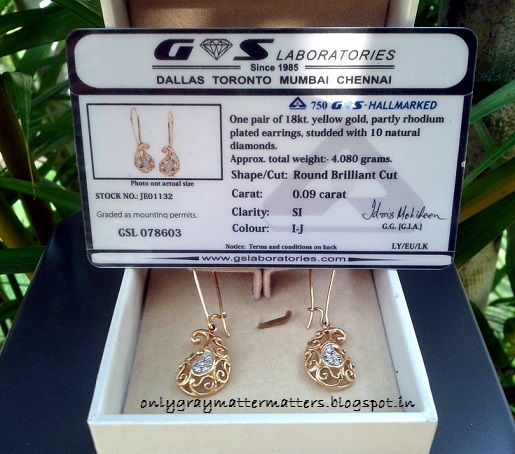 As a customer, it was surprising to know that the weight of the same design of earrings can change over time and hence the price would vary accordingly. Caratlane explained that after every few pieces of a particular design are sold, they may make changes in the thickness of the jewelry to make it sturdier or lighter based on customer feedback. 2. Concern # 2: Price of Caratlane Jewelry is not consistent with the daily market rate of Gold. Jewelry prices are updated at a certain interval unknown to the customer. Reply from Caratlane: Jewelry and Diamond prices ARE consistent with the daily market value of Gold and are updated weekly based on the dollar rate change. For significant change in $ value, changes are made immediately. The value is more noticeable in high value jewelry pieces and solitaires where even a small change means a difference of at least 10 to 20 thousands rupees or more. I checked and did notice that the price is being changed regularly. 3. Concern # 3: No transparency in terms of break up of price as Gold price, Diamond Price, Polish, Making Charges/labor etc. Reply from Caratlane: I had mentioned that Caratlane offers a price range starting from very low to as high as your pocket allows, which means something for everyone's buying capacity. They said they DO have a breakup but if they start selling low value beautifully designed items according to gold price break up, they won't be able to provide the kind of creativity in designs that they are giving right now for very low value items. Plus they bear additional costs in jewelry certification and jewelry insurance during shipping. They get every piece of Jewelry certified from reputed labs which local jewelers don't do. So they show an overall price tag and not break up. But they said they will consider this feedback too and I noticed that they have already started updating the price breakup on their jewelry items (including the paisley earrings I had bought) and are in the process of updating more. Caratlane also shared how the online Jewelry stores in the US sell diamonds studded mainly in Silver now and still that jewelry is sold at a very high price tag, with no break up and the only choice of 'buy it or leave it.' 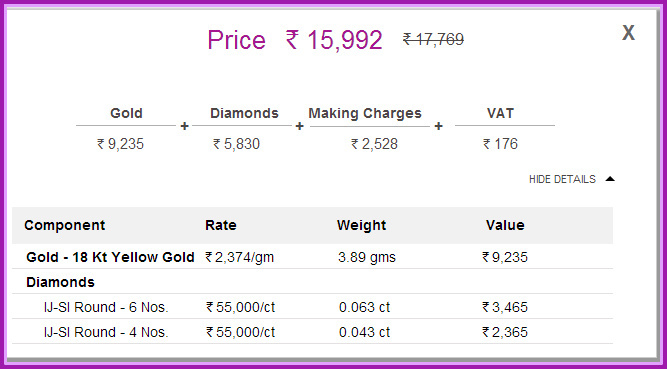 Customers are paying a very high price for readymade diamond jewelry made in Silver there. Considering that, they said they are still offering pure 18 Carat gold to their customers and charging them accordingly. 4. Concern # 4: Weight of each Jewelry item is mentioned as Approximate. You can see the actual weight only in the certificate when you receive it. Reply from Caratlane: All Jewelry designs are first created in other metal alloys and are then made in Gold at the time of order. 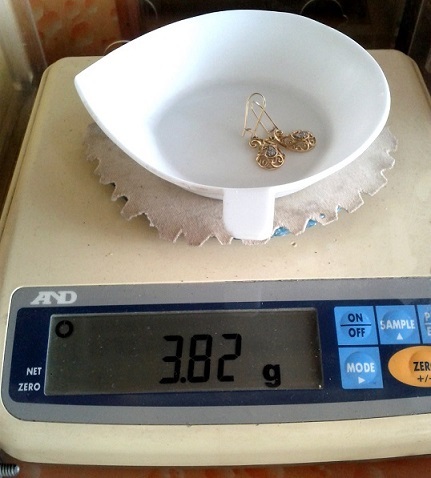 It is not humanly possible to create Jewelry pieces with identical weight each time and so they allow a +-5% difference in weight according to their quality standards. The weight does go up in some cases which benefits the customer and whenever the weight has gone down by more than 5%, they have always manually issued a refund in the form of a cheque. Creating a cheque requires someone to sit and manually calculate the refund value and my customized order was timed around the rush time of Valentine's day. In fact, they had asked Ashish Kapoor to contact me and a few other customers to check on the weight and provide a resolution, but Ashish Kapoor never conveyed this to me. I did check other reviews on the internet and confirm that Caratlane actually gave refunds to people for weight difference and even offered a complete return wherever the customer refused a refund and wanted to return the jewelry. Caratlane mentioned that they are now looking into automating the refund cheque creation whenever there is a -5% difference in the final jewelry weight. 5. Concern # 5: No customization allowed. Reply from Caratlane: Currently customization is possible in case of solitaire rings or if you have seen a jewelry design anywhere in the world and want them to make it for you, in that. But they are now considering providing more customization options to customers like I choose a certain design of earrings but want higher carat weight or higher clarity diamonds in them, so I should be able to choose that customization. 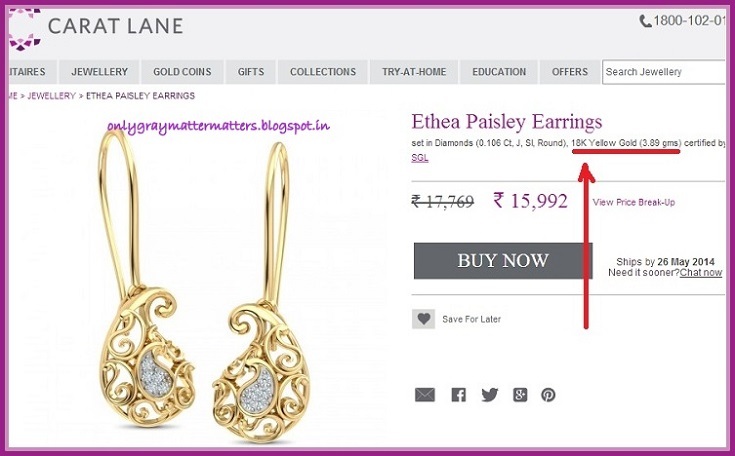 Caratlane also pampers its regular customers and makes note of their minutest details like a difference in the height of someone's ear holes or the angle of the ear lobes which may be making earrings fall at different heights from the ears or hang at different angles. Then they customize and design all new orders for that customer, keeping these details in mind. This was something new and interesting I learnt from Mr Mithun Sacheti (CEO and Co-Founder of Caratlane), who has a rich experience and great understanding of Jewelry from his diamond jewelry family business (Jaipur gems). They have been doing such customizations for their customers there for generations. 6. Concern # 6: There was a difference in the look of the gold I had received in the first go and the one received after customization. The initial one looked more white and the customized earrings looked more golden and polished. Reply from Caratlane: 18 K Gold Jewelry means there is some other metal added to Gold to bring it down from 24 K to 18 K and also to increase its sturdiness. They were using Silver to make an alloy with Gold, so as to give good value for money to customers. This is why my earrings ordered during GOSF looked whitish. The pairs I received after customization of the hooks looked Golden because the alloy metal was recently changed from Silver to another for certain reasons. This means these pairs were not customized but actually re-made. Now the newly made Paisley earrings I have finally received in the 3rd attempt again look whitish which means they are back to Silver. They keep making changes to make their products better and then stop and assess and decide further accordingly. If any of you has undergone a "Quality Training or Certification" (I am certified), you will understand how important this approach is considered in quality maintenance. So overall, Caratlane did listen to my every cry as a customer and I applaud that they actually made all the changes they had mentioned they would 'look into'. Besides the above concerns, I had also shared some website related feedback and ALL of that has been fixed. I had a very negative impression of them but their delivering perfectly on all aspects has turned over my opinion and has restored my faith in them. I haven't seen any other business take feedback this seriously and actually work on every single point shared. In terms of communication, my whole experience with Caratlane.com was very good, except the gap I had faced when dealing with the lady in the design team during the customization. But then I am told that these (design team) guys aren't ever brought in direct contact with the customer as they need to have their minds free and keep their creativity flowing. As such they have a very challenging job of creating a new collection every week or so. During this entire episode, I was in touch with Mr Mithun Sacheti (CEO and Co-Founder of Caratlane.com) and I was surprised to see how simple, clear-hearted and dedicated this person is and he is one of the humblest people I have come across. He is a treasure cove of information and experience when it comes to Jewelry and customization for clients and I got to learn many things which happen in the background, which I as a customer may have never understood or even considered. 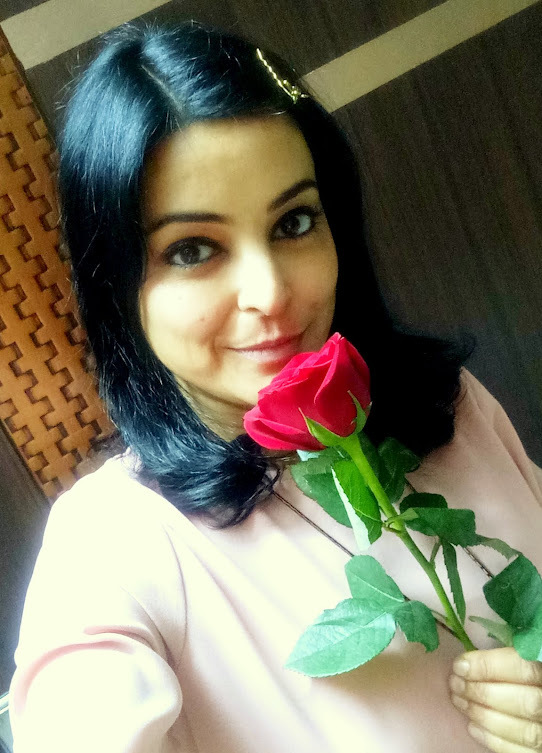 I was also in touch with their Customer Service Head Radhika, who has been amazingly open to every single feedback I have shared no matter how small or significant and was very polite. There was not a hint of bitterness in any of the conversations with these people, despite what all I had written in my initial negative experience. I am no longer afraid to shop with them again whenever I have the money and from my first hand experience, I can now safely recommend them to you all. Now here are the pictures I would love to share with you all. Ohhhh i am actually scared in buying jewelleries online! The designs are very pretty and delicate though! I have also been trying to order an item from Caratlane and I was not sure whether to go ahead or not. 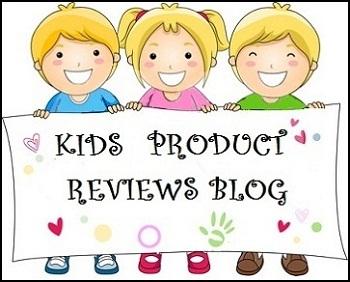 After reading your blog, I feel that I cannot stay patient like this doing back and forth exchanges on getting things corrected and I am glad to not have shopped online. It would be better to go to a reputed jeweler like Tanishq and choose something one likes or go to a trusted local shop (thankfully most of our parents know one such jeweler) and get customized jewelry. Thanks so much for posting such a detailed review. You are welcome dear. Actually when I was in Delhi, I had visited Tanishq many times but never got any thing within my pocket and the designs were jst very okay. Recently I had checked out Tanishq online too and many other leading online Jewelry stores but the designs offered by Caratlane, those other jewelers stand nowhere close to it. Regular designs don't appeal me and Caratlane attracted me in the first go, which meant there was something special about their designs. Even I got tired of the back and forth at one point in time but mine was a one off case. I took time to read other reviews on mouthshut etc. And the back and forth happened mainly because things could not be coordinated in time. Sometimes I was travelling and was unavailable and other times their team was travelling. The best part was I was allowed to keep and wear the jewelry till the replacement was ready, so it didn't affect me at any point in time. In the end, when they sent a final 3rd pair, I was asked to first try both patiently and keep the one I liked best. What more could I have asked for? But I respected that liberty they gave me and had actually packed away the paisley pair, kept wearing the other heart earrings I had bought. We also have a famous family jeweler but I haven't bought from them for years because I don't always get the kind of unique designs I yearn for. Once I gave them a very unique bracelet I used to have, for a little customization and they remade it into something very ordinary without understanding the instructions. Here they told me at every step as to what change they had made. And by the way they also have lounges in many cities, as in physical stores like Tanishq and try at home option in 20+ cities plus expanding. Even in a far off area like mine, I can request try at home in my nearest city now. After all the changes they have made and the phenomenal 100% action on my feedback, I would love to shop with them again. Thanks for the detailed feedback. I am an ardent lover of Caratlane designs and though I am an avid online shopper, I hesitated about buying gold jewellery online. Thanks to your review, I may just give it a try. I think it was a special treatment for a blogger. Hey Pritish, you have every right to think that way. But that is not the truth. 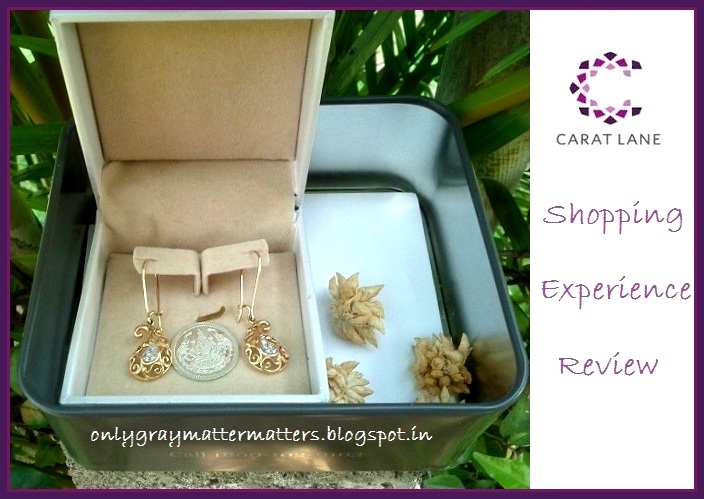 When I first wrote the review, they didn't even know about it and after they came to know, they contacted me and Mr Sacheti's wordings were "We don't get affected by a small article here or there but Jewelry is meant to bring happiness, that's what we create it for and so we will see what we can best do in your case". Later this review went famous and I got to know from one of their employees that people have been calling up and mentioning my name when placing orders. That's when they got back to me and indirectly asked me to shorten the review so people can have a clear picture that they did resolve my concern. Later I placed two more orders in the last one year. Both turned out poor products. One I had gifted but the diamond ring I bought for myself was recently returned a few weeks ago. I have a whole new story to share and would do another post on it. I am done with Caratlane. I think they took all the pain of exchanging and refunding etc considering the fact that you are a blogger and you already have wrote a review about them. But what about people like me staying in US or anywhere outside India who are fond of indian designs and being out of India not able to communicate easily because of the time diffetence and other concerns.i read your reviews when I was looking for caratlane reviews desperately as I want to buy some jewelery from them but now I an in dilemma,whether I should invest a big amount on this website or not. Dear Sakshi, please read my reply to the comment right above yours. Please don't buy as out of my 4 orders, I didn't have a single perfect order or product. I returned the Yonder heart earrings and pooled more money to buy a diamond ring. That was like a ring made of thorns and cut my body and back mercilessly. I complained and got to know that the mould in which it was made was defective! Imagine how many more people would have bought the same product and I wonder nobody complained? Well they exchanged it and sent me another one, which was again defective. Finally i got 80% moneyback as per their return policy. Please do not buy from them. The designs are extremely luring but there are numerous other flaws in their products. Bought a pair of earrings as a gift for a relative and the dangler funnily rotated 180 degrees so the back side always showed in the front and the actual design at the back. I kept purchasing thinking it was a one off case but how can they have 4 orders badly served one after the other and that too with the same customer? The definition of quality is doing it right the first time and every time but with them it was doing it wrong the first time and every single consequent time. What about visiting their stores. Would tat be a safer option compared to online. Wat abku platinum jewellery. Do they sell authentic jewels. Anyone has recent experiences. From the past few weeks I have been going through hell. The guys at Caratlane are giving me a very tough time. The thing is that a few years back I bought a diamond ring at caratlane for a very very cheap price. Now when I wanted it exchanged, they gave me a good LTE value of almost 9k more. And I sent the ring to Chennai. Now that ring was bought without any discount codes and promotional codes or offers. And I have the original copy of the invoice that proves that. And in exchange fro that I had chosen a plain gold chain. Caratlane wants to somehow sabotage this whole deal. I am calling them up 2 - 3 times in a day from three weeks. They are acting like sore loosers now. And everytime I call, it's either one excuse or the other. And the best part are the lies. Like totally lying to my face! While exchanging this ring I got a receipt from caratlane stating the value of the ring as well. The have a tie up with a local courier Vbj in hyderabad and it was sent through this. And I did a clever thing and called Vbj and asked if the ring was delivered at Chennai, and the lady said yes and that caratlane products get delivered the very next day. But customer service lied to me for a whole week saying that they hadn't received the ring as yet. Then I told them that I called Vbj, then they were like oh yes we did receive it, sorry and this and that. I have all the proof, the certificates, invoice, screenshots of the actual value of the ring npw, chat transcripts, everything and voice recording as well. I am sick and tired now. I even contacted the director on Facebook. Do you have any idea what I can do now? Hey Rishi, thank you so much for sharing this experience. It does throw a light on their real doings as personally my experiences with them have also degraded with time. They did resolve my concerns each time but it was a harrassment to follow up so many times and every time I call, I get to know that the manager I was following up with, has resigned. So it seems like managers there don't work for long and surely there are more people out there cribbing for their poor experience with them. Precisely because of the same problems that you faced, I asked THEM to pick up my diamond ring, which was like a thorn ring and got it returned. They sent it back 3 times claiming it has been 'fixed' and 'repaired' when it was still the same bad ring cutting in my skin and face. Anyways, please email me at lifesutrabygagan@gmail.com or at onlygraymattermatters@gmail.com. I will share the ownder's phone number and you can try contacting them directly. That's what I had to do. 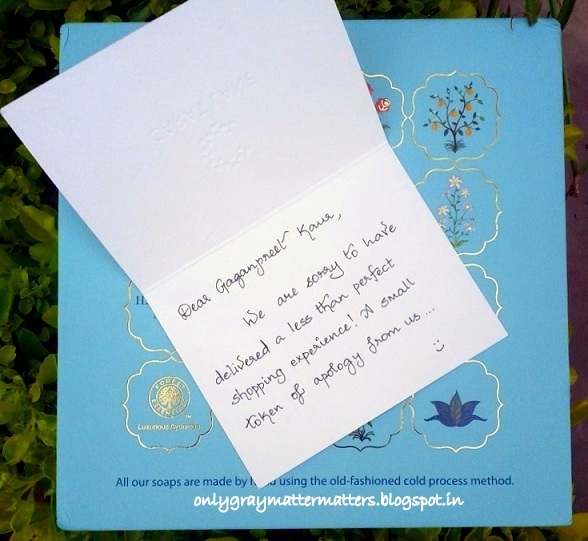 Thanks Gagan for your detailed review about the Caratlane... For the last couple of days, I was keenly checking the products on this site to order a gift for my better half, and my mind was in a dillemma to go for it.. then happened to see your blog, now after going thru it , I am wary and wanted to stay away from this online site..
Is there any sellers who are genuine, whom u hav tried with... I was going across the web and I see one more site - http://www.bluestone.com/, equally famous and accessed like caratlane, thru data from Similar web portal.. Your comments or suggestions would mean a lot.. thanks..
Dear Vijay, you did spare yourself a lot of harassment by not purchasing from Caratlane. I had checked Bluestone a long time ago and even though the designs were really beautiful and they had far more variety than Caratlane, what stood out was that most of their jewelry was in 14 Carat and the prices were too high as compared to other similar portals. Like what was available on other sites under 18 Carat, Bluestone was selling for the same price in 14 Carat quality. Then I was approached by Kuberbox.com owner, who offered that I try them out. But at that time I had lost so much money over Caratlane purchases, I didn't have the heart to take any more financial drain. Kuberbox may be good and they also had a free repair policy for the first year of purchase, but I have never purchased from them yet. There is also Candere.com. Tanishq is way too costly. I haven't purchased new gold since, though I want to. I am still wearing the paisley earrings from caratlane since then and that is the only piece of jewelry i have left from them :) Rest all is returned. The most luring thing about these online portals are the intricate designs pictured to perfection plus low prices. Like you cannot find anything in the 5-10K gift range if you go to Tanishq etc. But these sites are offering even very small pieces of jewelry, something to fit in everyone's pocket. However, those are very fragile pieces of jewelry. If you buy something in this small range, you would expect to be able to 'rough' use it by wearing daily. But on the contrary, the jewelry offered by caratlane etc in the lower range is so delicate and fragile, you always fear that it would snap off and fall and you won't even come to know. So if you are looking for something special for her, something in a little higher range, try out a good local jeweler first. I am from a small city and even there the local jewelers have stepped up a lot in the past few years in terms of fashion and jewelry designs. So I am sure in bigger cities, it would be far better experience to purchase directly. Thanks again for ur time and opinion, Gagan... 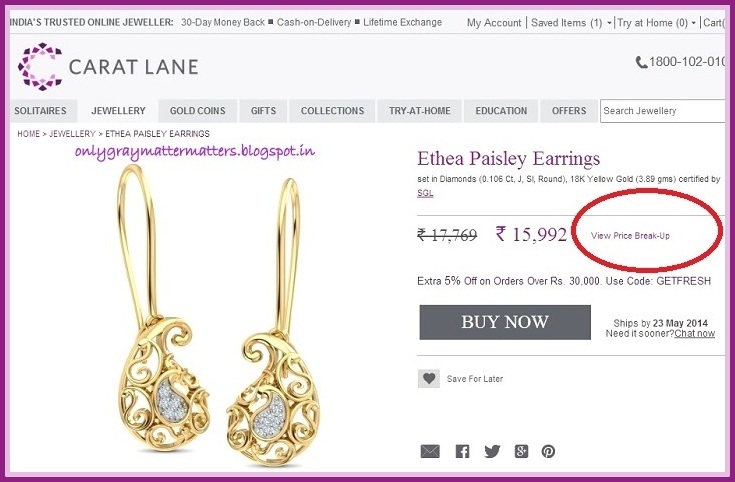 I am looking for a gift in the range of 30-40k, mostly earrings with diamond studded, so bit cautious to see the reviews before attempting for a purchase. As u said, My parents and family have a local jeweller with a good rapport for a long time, but again it involves lot of arbitrations and bargains to conclude at the final price, which I am not familiar and happy with. Also being in this generation, I wanted to break the trend of buying gold from my parents perspective. Let me try out the other websites posted by you and come back to u with my opinion.. cya.. I am really surprised with your experience. 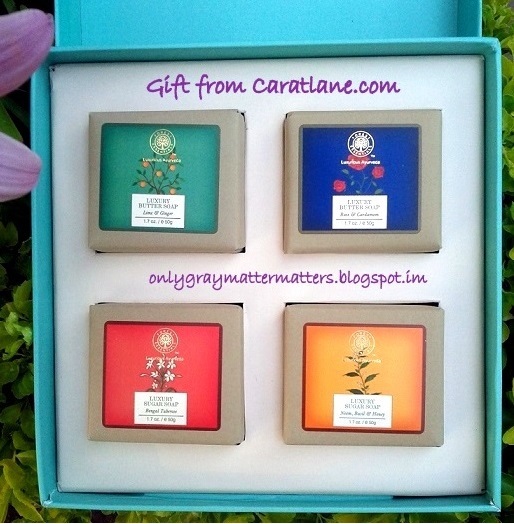 Although I am a fairly new customer of caratlane and bluestone both. I guess they improved with time. And I think most of these improvements are because of you. That means they truly take customer feedback seriously. And then again they messed up with your orders. So i am really confused what they are up to. My experience with both of them is very nice. With caratlane I have bought 3 pieces and all of them are super pretty and at every step from order confirmation to dispatch I was informed. Also before dispatch they always sent an e-mail detailing the gold or diamond carat difference if there is any with the amount i will be getting as refund. And the jewellery was really well crafted. Two of these are for gift purpose for which I ask gift packing and they provided very pretty little box with lace bow which I loved.One neck piece I ordered was for me which was again very pretty and I am ordering for matching earrings this month. So with this neck piece I had some direct communication with there customer care as the delivery was delayed. I contacted them and told them I need to wear the jewellery for some function and gave them the date on which the jewellery was needed. The dispatch date was updated twice. So I got worried that I'll not get the jewellery on time and told them to please cancel my order if they can't deliver on time. But they did deliver the jewellery before the date given by me. And also gave me 8% refund for delaying my order which was 2800/-. Now that I think is really considerate of them. I was already a satisfied customer as they delivered before my function date but even then they provided this refund. I am a satisfied customer till now. But I am really surprised how they messed up with 3 of your orders and that heart shape earrings of yours was really not looking like gold. Its very nice of you sharing your experience so that others can decide. Really helpful blog.